“Look Daddy,” said the “little emperor” at the Beijing Zoo at left. 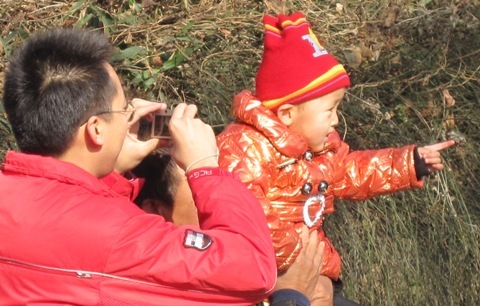 One-child family are still the norm, according to our guide, Owen, of a 9-day tour of China I just took. The Chinese still prefer boys over girls. I saw groups of adoptive parents getting ready to export their baby girls to new homes overseas. Whether a little emperor or empress, parenting one child is different from raising two or more children, as the Chinese have discovered. Only children have the necessity and tendency to learn to navigate an adult world and get used to having life catered to their whims and desires. Saying “no” is one of the best gifts a parent can bestow to their little emperors and empresses. If not, the desire for power will only escalate and could explode when the child enter adolescence. Little emporers and empresses are not used to being told “no,” thinking about others or doing chores for the common good. Implementing a family chore system will combat the “little emperors/empress” syndrome, common in China and the USA. Empower children to make good decisions because chores teach children how to manage time, and projects, and life skills. My book, “Raising Able: how chores empower children to make good decisions” will be published in 2010. I describe the advantages of childhood chores, including taking mom and dad out of the servant role and de-thrones little emperors and empresses. Children can start doing chores as young as soon as they’re interested — as early as 18 months old. Parents can expect children and young adults who live at home to contribute to the running of the household on a regular basis. It’s up to parents to create a family chore system and follow through. It’s worth the investment of time and trouble, even if the children don’t do the chore up to your standards. Doing chores teaches children and teens valuable life-lessons and combats the entitlement of little emperors and empresses. You are currently browsing the Raising Able Children: how to nurture capable confident young people weblog archives for December 2009.